Q: What made you return to science fiction writing after all these years? A: There are some activities that are simply so much fun that one can’t give them up. Writing is that for me. I love every opportunity to write. Many young writers are told to write in order to learn how to write. That is good advice. I used to find any excuse to write because I loved to do it. If I didn’t have a typewriter, I wrote in longhand. So when my 50th anniversary as a professional writer came around, I decided to celebrate it by doing it. It was like a present to myself, so to speak. Plus, look at the bestseller lists and you will see the pattern repeating. Science fiction and space travel is dominant. Q: What direction do you see science fiction going now? Is the trend toward epics and battle stories such as Star Wars? A: You must remember that science fiction is simply a method or a means of telling the story. Regardless of the genre (science fiction, western, spy, romance), you will find that people like a story that is both real and has a purpose. It has to say something or achieve something. Science fiction points a direction because it does advo­cate a future. It is about Man and his Future. Q: What role did science fiction writers and their readers have in the development of space technology and travel—and public acceptance of it and its funding—in the 1950s and 1960s? What role does it play today in future commitment to space exploration, colonization, exploitation? A: If you will go back through those old, gaudy pulp magazines that were being ridiculed and confiscated by irate teachers, you will find a lot of articles on space technology scattered amongst the fiction. That was be­cause there was no other outlet for such vision. Some who wrote for the pulps were called “just science fiction writers.” But history has proven that they were the ones who brought about the future—not the naysayers. We knew then that Man would travel to the stars and we know it still. There are still those who cannot create a vision for the future and they, as before, still click their tongues to make a living and they will, again, be forgotten simply because they cannot create—they can only criticize. Q: How would you assess the broader audience science fiction has today? Years ago, science fiction was consid­ered as something for children which was not “serious” literature. Its popularity today knows no age boundaries. Is this indicative of an escapist attitude by readers? Or a look to the future and what we could be? A: The future is the only frontier without limit and the frontier that we will all enter and cross no matter what we do. Science fiction is and always has been the literature about the frontier. Science fiction appeals to every age group because it is about the future and the human potential. Q: How do you draw from your past track in creating character and plot? Is this the place from which science fiction comes in general, whether the writers know it or not? A: Experience helps any writer or anyone who wants to write. I traveled through the Far East and sailed the high seas and did a few loops in some bi-winged planes and gliders in my day and drew upon these for stories. I also did a lot of research for other stories. But what is more important is the ability to see what is in front of you. Plus you have to have the ability to assume the viewpoint of your reader. For example, in Battlefield Earth, the reader looks through the eyes of the hero and through the eyes of the alien. This is done by describing how each person would describe the scene and objects. It gives the reader a feeling of what it would be like to assume that viewpoint. The reader at first does not recognize the object either but should be able to do so as the description continues. But, in the process, the reader can experience the same mystery as the character in the story. That is the ability to see what is in front of you and the ability to assume another viewpoint. It is a good exercise for writers. So experience is helpful but you need much more. Q: What does science fiction writing do for L. Ron Hubbard personally? A: I can answer that better if you don’t restrict it to just one genre. Writing offers creation, expression and the ultimate ability to communicate, whether you write poetry or a novel. Science fiction is just one means or method of doing that. With writing, you must take an idea and turn it into little black marks on a sheet of white paper so that someone will look at it and lift those little black marks off the page and form the idea of the author. In short, it boils down to communication. 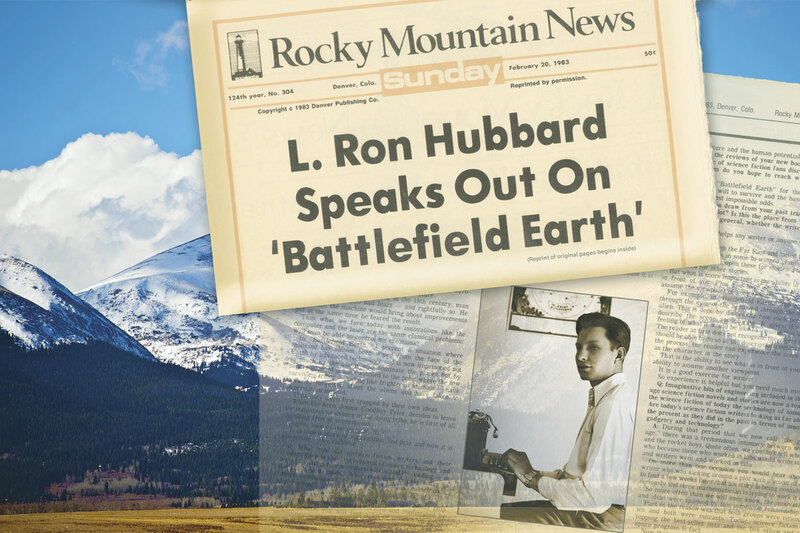 Q: How would L. Ron Hubbard describe himself as a writer? A: I don’t know if I can take it any further than that. I’ve always had the ability to put an idea down on the page. I don’t really outline. I just write. I think if I wanted to be characterized in a certain way as a writer, I would ask that it be that I am a writer who loves to write. That is not as axiomatic as it may sound. There are a lot of writers who don’t like to write and some who even hate it but are still called “writers” because they make a living at it—the 9 to 5 type, so to speak. But it has never been that way with me. I don’t watch the clock when I write. In fact, I’ve gone days without sleep just because I was enjoying myself so much I just plain forgot. How could one forget to sleep? Well, just imagine doing something that is more excit­ing than anything you have ever done and see if you worry or think about a “coffee break” or what time, it is. That’s what I mean by my being a writer who loves to write. There’s really no other way to say it. Q: How do you work? Do you dictate or pound your fiction out on your old typewriter? Do you keep any set schedule when doing a book? Do you work from detailed character sketches and plot outlines or do you wing it? Have your working methods changed over the years? A: My goodness, but that covers a lot! What I write determines how I do it. Sometimes I type, sometimes I write longhand and sometimes I dictate. Battlefield Earth was typed on a manual. The length was about 3,000 pages. Each day before I went to bed I would sketch out the plot that I would cover the next day. Plus I would list out anything else that I wanted to accomplish. I do set and follow a schedule when I want to get certain things done in a day—like exercise, if only a walk. So I generally lay out what I want to accomplish for the day, the week, the month and then I do it. I would say this is perhaps my primary development since those early days in getting organized. It has allowed me to get more accomplished to lay out a schedule and then do it. Q: What do you think about writers who take years to write a single book? A: I really don’t think many do. They might research something for years, but I can’t figure out how somebody could keep a plot in his head that long. Some people try to equate quality with slowness. If an athlete did that he would lose every game. A: Write and write and write and write. And then when you finish, write some more. It may not be original advice, but it is still quite true. You learn to write by writing. Don’t try to learn how to write in order to write. I’ve seen a lot of great writers killed off when they decided they wanted to learn how to write. Just take an idea and go with it. You may find a story that pulls you along. The story takes off on its own. It sounds silly but it happens. You have this character walking down the street and you are all ready for him to get into a taxi but he walks right on and turns into a movie theatre. Whoa! What is this? Well, follow him and see what happens. The main thing is to write and learn the business of writing—that tough market you have to live with.